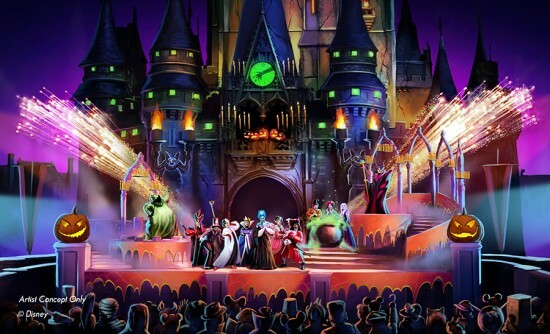 Starring the Sanderson Sisters from the classic live action Halloween time movie, the new “Hocus Pocus Villain Spelltacular” has been announced for Mickey’s Not-So-Scary Halloween Party 2015 at the Magic Kingdom. It’s a brand new stage show featuring Winifred, Mary and Sarah along with Dr. Facilier, Oogie Boogie, Maleficent, Hades, Cruella, Jafar, and more Disney villains. The show will take place in front of Cinderella Castle, combining projections, effects, and plenty of dancing during Mickey’s Not-So-Scary Halloween Party, on select nights between September 15 and November 1, 2015. Will they be meeting guests after the dance party? Tell me Billy Butcherson will be in the show and I’m there. I’m so happy that Disney is bringing out Hades and Oogie more. Both of them have been bringing in HUGE crowds since the first villain event on Friday the 13th. “Starring the Sanderson Sisters” ??? Is it still April fools? I love the old show to death and I guess it’s becoming less relevant, but this 100x less relevant in 2015.